Here in the South we consider watermelon and peaches our fruits of summer. Now I’m a Southerner by choice not birth, so in other places the fruits of summer are different. As a boy growing up in the Midwest and West one of the treats of summer was rhubarb. Its tart bright taste always takes me back to summer and my childhood. Rhubarb isn’t really a fruit at all because you cook the stalk (technically known as petioles) but Laura Ingalls Wilder in her book The First Four Years calls rhubarb the “pie plant” and in much of the Midwest it is still called pie plant. Rhubarb is an odd plant, its leaves are poisonous to people but useful in natural pesticides and the stalks are delicious as well as having known cancer fighting benefits. Rhubarb can be hard to find here in the South. When I found rhubarb in a market one day I snapped up a couple of pounds of the stalks which resemble ruby colored celery. The nice young lady ringing me up said in her Southern drawl ‘what is this? I have never seen it before in my life.’ At that point I knew I wanted to share a recipe using this delicious treat, but what to do? In some countries they serve the stalk just dipped in sugar or chili powder and salt, although portable it probably doesn’t require a recipe. But what is more Southern than pie, and a refreshing icebox pie in our summer is just the ticket to serve up on a sultry evening. 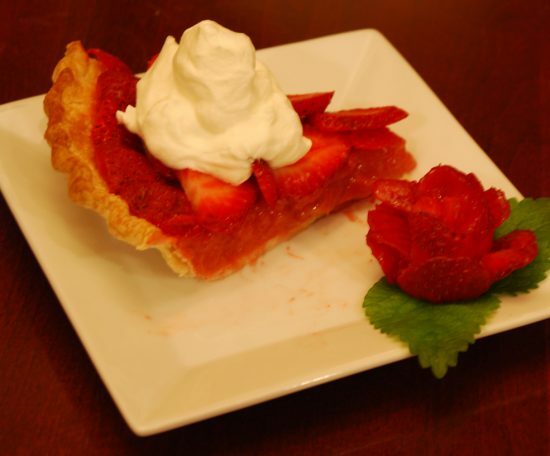 The tangy brightness of the rhubarb paired with fresh strawberries and a dollop of whipped cream set off by a flaky crust is sure to have folks asking for seconds. Pre-heat your oven and bake the pie shell. I played with a couple of methods and depths, the pie works both as a deep dish as well as a standard depth. On the deep dish… I used pie weights to hold the crust in place and on the standard depth I just pushed the crust into the plate more so it did not shrink as much. Remember to spray your pie plate with a nonstick (I like Bakers Joy) and use a fork to puncture around the base. Bake the shell till mostly done, then remove, paint with the egg white wash (the separated white with a bit of water) and put back in to cook for another couple of minutes. This seals the crust so it will stay crunchier. While the shell is baking cut the rhubarb into 1 inch cubes simmer with the water and sugar. It will start to break down into a something almost like stew. Don’t overcook or all the rhubarb chunks will disappear. Dip 1-2 cups of ‘liquid’ out of the rhubarb, let cool and use to proof the gelatin and pectin. This keeps it from forming clots vs. pouring directly into the hot rhubarb stew. You can experiment with different spices I put ½ teaspoon of cinnamon, and ¼ teaspoon each of cardamom and nutmeg with just a pinch of salt. Your combination will make your rhubarb pie your secret recipe. Let the cooked crust cool and add the gelatin/pectin mix back to the main pot of rhubarb, stir in and heat to incorporate. (Sort of like making jam). Let cool to warm but not set then pour into the crust and refrigerate. Clean and slice the strawberries, at this point you can macerate them in some sugar or just use them as is on the cooled pie. I spent time arranging them, but they could just as easily be poured over for that casual devil may care look. Garnish with some whipped cream and serve. Till next time, Make it Your Own. Follow Glenn on Facebook to continue the culinary adventure.